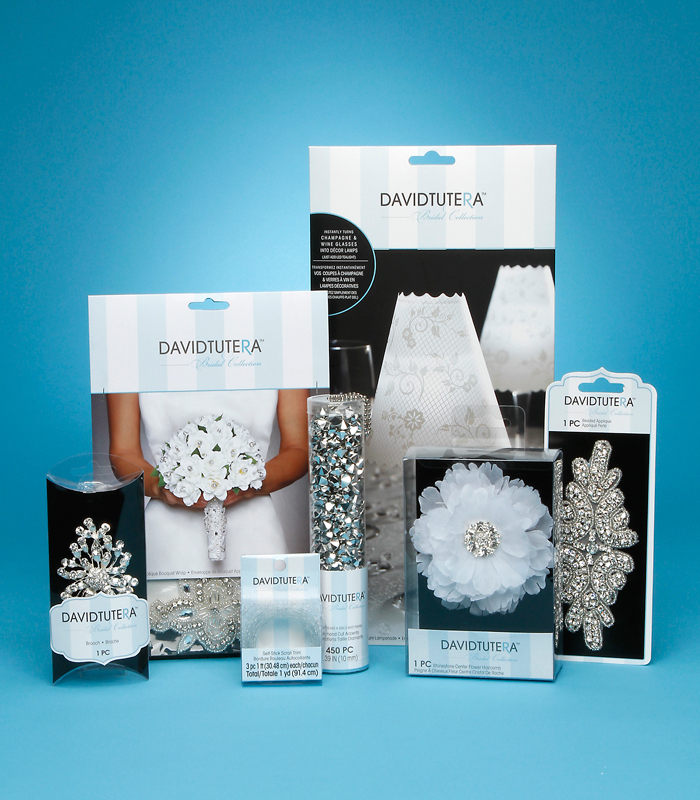 My decision was solidified when I received some items from the David Tutera Bridal Collection to try out. 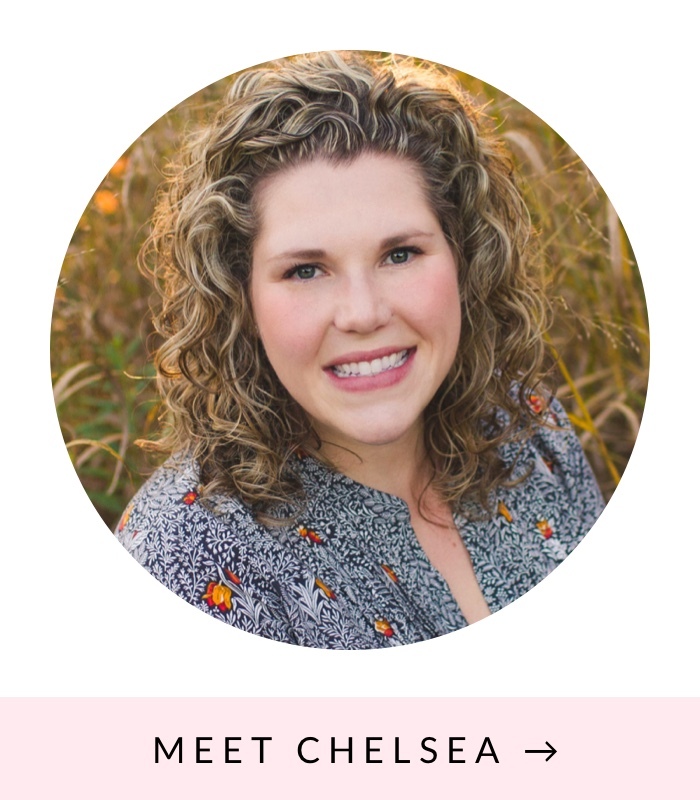 There are so many beautiful and budget-friendly items in this collection, which is available at Michael’s, and I knew a couple items would be perfect for my half-sister’s wedding card box. 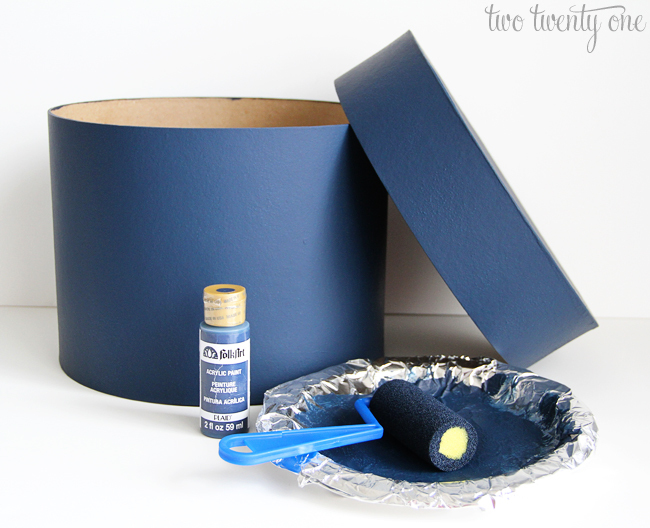 Start by painting your paper mache box. I applied two coats of acrylic paint with a cheapo foam roller. Next, cut the hole for the cards. I made mine 7 1/2 inches wide, and cut it out with an Xacto knife. 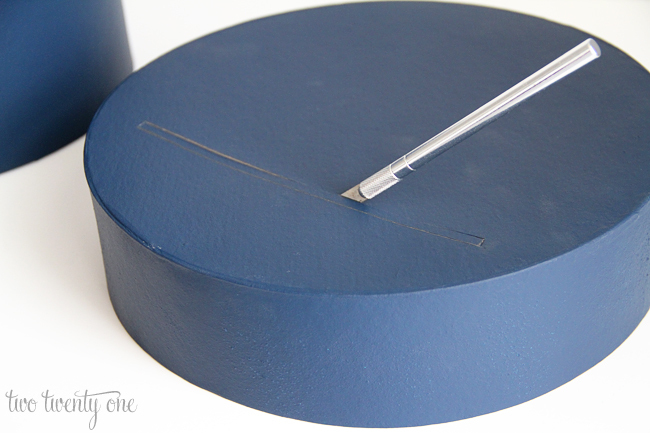 Touch up your card slot with paint after you cut it. Or just cut your card slot first, and then paint. Add your ribbon, securing it with double sided tape on the backside of the lid. I hot glued the flower hair comb on top of the ribbon. Who says you can’t use items meant for your hair on your wedding card box? No one. That’s who. Create a “Cards” sign– you can do this in Word or Photoshop. I used the font Lavenderia. The border was made by cutting up some of the ribbon and securing it to the edges of the card stock with double sided tape. 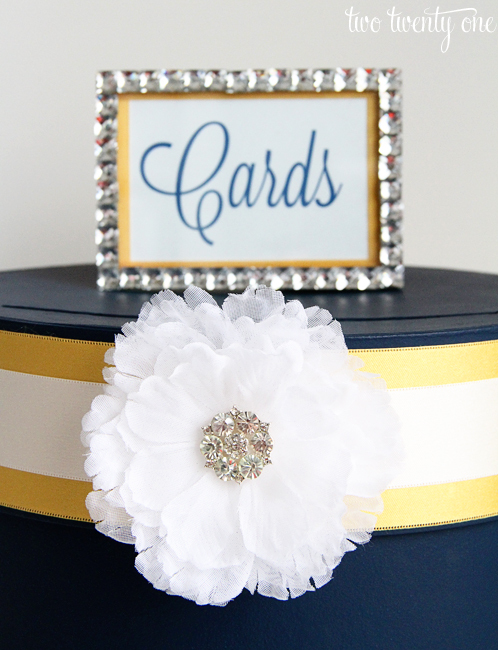 I used a rhinestone table number frame to display the cards sign. Seriously, this is one of the easiest and most inexpensive wedding projects you can take on. This DIY wedding card box took me less than an hour to make. If you or someone you know is heading down the aisle soon I highly recommend heading to Michael’s and checking out the David Tutera Bridal Collection. Check out some of my most popular posts! LOVE this card box! My mom made one for our wedding and I still keep cards in it! I WISH I had seen this before I got married almost two years ago!! I did all my planning BEFORE I discovered Pinterest, which I guess can be a good thing and a bad thing. ANyways, this card box is beautiful! Very cute! I love the blue color you used. My grandma has a stand-up bird cage and that’s what we used for cards. It was quite lovely. 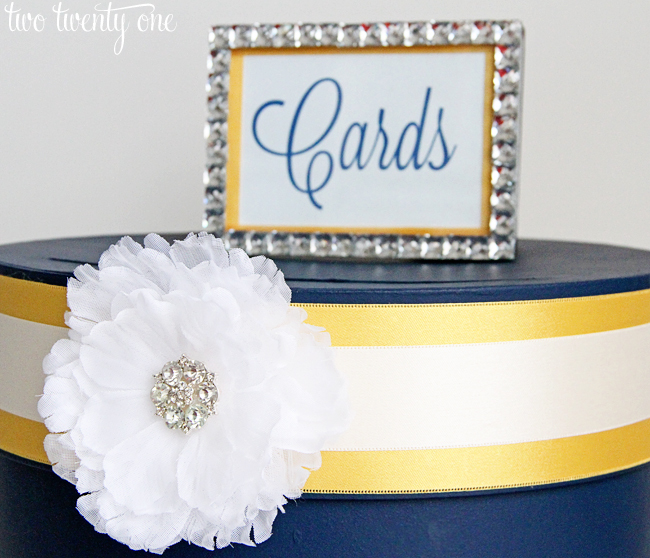 I love all the creative and pretty ways to store cards at a wedding. Luuuurve it!! Adorable, as always!! Congrats to your sis! That is so cute! I love it! We used a mailbox that my college roommate painted our name on. I want to use it outside, but Jesse doesn’t want it to get messed hope (he’s so sentimental). This is gorgeous! I’m sure your sister loves it! I need to talk hubby into a vow renewal or something so I have an excuse to do some cute wedding projects! Thanks for sharing! This is so beautiful and I’m sure your sister thinks so too! Congrats to her! Beautiful! I love the bling!! I wish I had had this at my wedding, that’s one of the details I forgot. Great project!!! 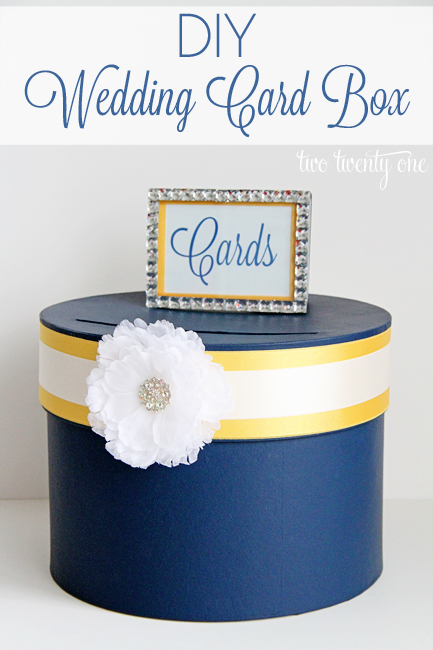 Beautiful photography… this card box is perfect for any style of wedding! I am totally making one of these for my wedding next Spring! 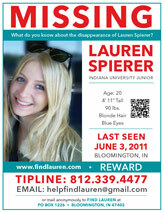 Thank you so much for sharing this. I need to make this! Where can a buy a box like this? May I ask- where did you buy the box from and what size did you use? Hi Nikki! I can’t remember where I bought the paper mache box– it was either Michael’s or Hobby Lobby. The box has a diameter of 11 inches and height of 8 inches. Love your box, I was thinking of making one covered with fabric, but this looks so much easier! To look shiny and “painted” thanks again! 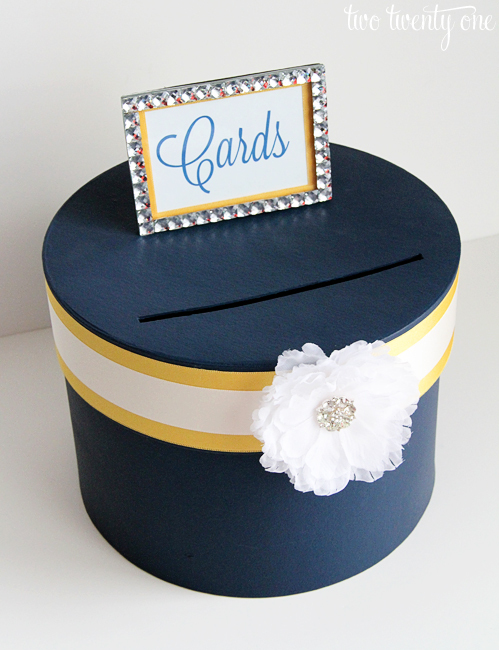 So, I tried making this the other day, and it turned out super cute, but the slot for the cards was a bit jagged. Any ideas for how to smooth out the slot?